According to Most Traveled People the world is made up of 757 countries, territories, autonomous regions, enclaves, geographically separated island groups, and major states and provinces. The aim of the site's members is to visit everyone of those 757 locations. Most Traveled People uses the Google Flash Maps API to display all 757 locations. 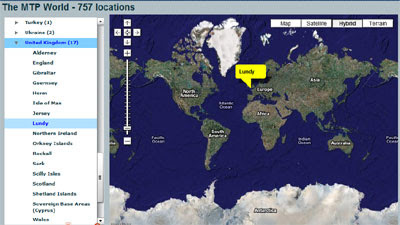 The 757 locations are listed in the map sidebar. Clicking on any of the sidebar locations will open a yellow marker on the map showing the location on the map. No one has managed to visit all 757 locations yet. The farthest along is Charles A Veley of San Francisco, who has visited 709, or 94%, of the locations.